I built an A-frame tractor a few years ago. It was nice because it was mobile and I could put it various spots in my garden. But I didn't find it very attractive. 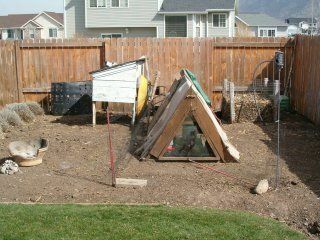 I've been interested in doing a 'playhouse' type looking henhouse and incorporating a run for the girls to play in. The sad thing is, I'm not much of a builder. I was going to enlist a friend to help me frame it but I ran across a kit at lowes. Originally in the spring the Kit was $299. When I saw it in August they were closing it out for $75. I couldn't buy the lumber for that price! The walls were premade...First step was simply assembling them into a box. I inverted one wall so the window became a chicken door. The next step was attaching the gables. They just screwed onto the tops of the front and back walls. One support goes in the middle and the roof boards are secured to both gables and the support. 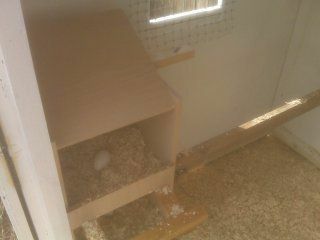 You can see one of my very curious hens in the bottom right checking out the workmanship. 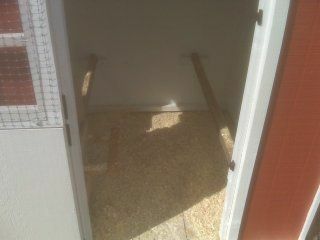 since the inside is empty I bought a small shelf that needed to be assembled from walmart for $10 to make nest boxes. Each shelf was 12" square which turned out to be too small for my standard/heavy breed hens so I ended up replacing the bottom shelves with 15"X12" boards to give them a little more room. Something I learned with this that the laminate boards that are nice for people shelves are very slippery for nest boxes...the poor girls would have most of their wood shavings kicked out in seconds and I had many cracked eggs as they didn't have a soft landing surface. The walls come with a thin coat of primer. 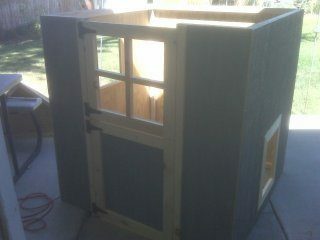 I opted to coat the inside and outside heavily with primer before painting. Then we found a redish mistint at the store and asked them to retint it until we liked the color. 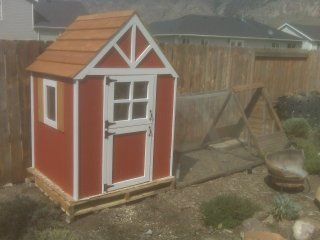 We were trying to go with a barn-red and white trim. 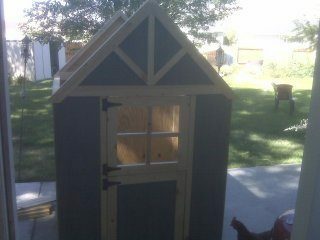 I also started putting in roosts. I put two in about 18 inches off the ground thinking they would like those. At the same time I was incorporating an ameracauna hen (named Sam...get it, green eggs & ham, Sam I-am!) 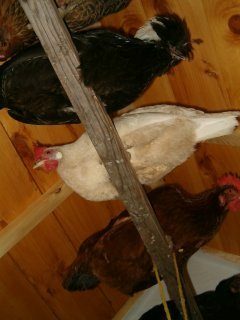 Since she is bottom of the list in pecking order, and she always liked to roost high, I put a roost 4 feet high for her to have a place to escape...I thought my heavy breeds whould never be able to get that high up. I was very wrong. Although it wasn't easy, all of my big girls liked to be on the top roost. That hasn't left much escape for Sam but things are getting better. They still take any opportunity to let her know she's not part of the group yet. 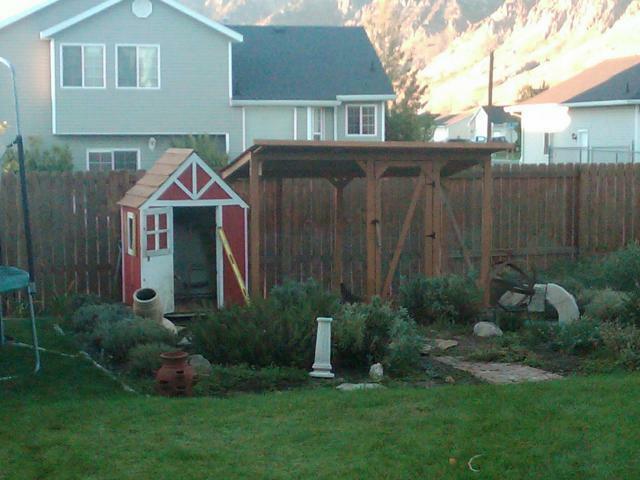 Now the girls new home sits in the back of my herb garden and looks a lot nicer in my yard! I have updated the run. A friend who is good at building helped me build something easier to clean and big enough I could walk into. "love the run, decor, landscaping-so cute!" Is your door a dutch door? I am thinking of doing that or just cutting a window that I can close up in winter. Would like to have the light in the winter so may just cut a window that I can put plexiglass in for the winter.